The Faith Based Left must stand up. Religious conservatives did this, we can do so as well. Here’s how pros do things. You lose, you take a shower, have a drink, and get ready for the next game. The left must accept that, for the next few years, we’re not getting anything out of government. SCOTUS goes back to 5-4, most likely with a replacement for Scalia that’s worse than Scalia himself. For the next two years, government is in total control of the Republican Party. We have to accept that fact and do what we can to mitigate its impact. These are just five areas right off the top of my head. Traditionally, we Democrats would use government to improve the position of all in these and so many other areas. That’s not happening now. We won’t have the federal government to help. We’re going to have to do them ourselves. Education. While liberals have always supported public education. We need to accept that funding for public education isn’t going to improve. Time to adopt the initiatives of the right, such as homeschooling. Health Care. ACA is gone, count on it. So, maybe they’ll work something out on pre-existing conditions, but even that may go. We need to look to private solutions, community clinics, and other non-governmental solutions. We do it in the third world, we need to apply what we do well in our own country now. Criminal Justice. The for-profit prison industry has been a disaster, and that’s not going to change with even greater Republican dominance of government. Public/Indigent defenders are barely funded as it is now. That’s not going to improve. Liberals are going to have to take the right to an attorney into the community. We need to nurture and support legal assistance clinics and private indigent defense practices. LGBT Rights. Liberals need to do what religious conservatives did in the 1980s, infiltrate and reclaim local government. We know most gains in this area will get rolled back at the federal level, so we have to work from the bottom up. Elect school boards The Left must become a faith-based communitywhose members encourage diversity and tolerance. It starts now. Poverty. We have to feed our communities. The government just isn’t going to do it. These are thoughts off the top of my head after a very rude awakening this morning. We need to make it all happen. These days, the right to counsel, and the right against self-incrimination are things we pretty much take for granted. it wasn’t always so. 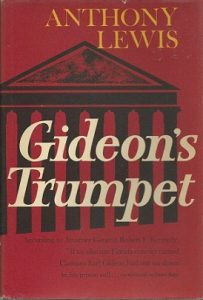 Gideon’s Trumpet is a book about a major legal case that was decided by the US Supreme Court in 1963. The case involved a man in Florida, Clarence Earl Gideon. A court in Florida refused to appoint legal counsel for Gideon, because Florida law at the time only allowed for court-appointed defense lawyers in capital cases. Gideon was convicted of burglary, and sentenced to five years. After submitting a hand-written petition to the US Supreme Court, that body took up his case. That resulted in a 9-0 SCOTUS decision in Gideon’s favor. He was retried and, with the help of counsel, was acquitted by a jury after an hour of deliberation. In 1965, Author Anthony Lewis wrote a book about Gideon v. Wainwright, the case. The book became a TV-movie in 1980. There was a time, right around when my younger sister was born, that we were “between houses.” My parents wanted to buy a lot and build a house, so they decided to sell our house, and we lived in an apartment complex for a while. One of the things that I liked about apartment living was the bookmobile. The library came to me rather than the other way around, so that was a fun thing. One of my dad’s friends was a librarian and drove the bookmobile. While I picked stuff to read, Mr. Jim would regularly choose a book for me. He checked it out in my name, and put it in my hands, on top of anything else I’d picked. Gideon’s Trumpet was one of those books. The book fascinated me. The legal principles weren’t all that hard for a fifth-grader to comprehend. Lewis presented the background of the story, offered an interesting portrait of Abe Fortas, the attorney appointed to represent Gideon before SCOTUS. (Fortas went on to become a Justice himself.) I love pomp and circumstance. Lewis’s descriptions of oral arguments before the court were fascinating. The decision was landmark. All defendants have the right to counsel. It’s a Big Deal, and it resonated with ten-year old me. I watched all the cop and lawyer shows on the teevee. I went on to join the debate team in high school. The notion of going to law school crossed my mind. I didn’t forget that concept. It’s one of those things that stuck with me, through the years, just like the times when a friend who is an attorney would point out that bail is not punishment. Bail backs up a promise to appear for trial. Other than traffic tickets, I’ve been fortunate to have never needed defense counsel in a criminal proceeding. I’ve had friends, colleagues, and others in my life who have been in that position. When I taught high school, one of my students was accused of murder in Jefferson Parish. I was 23 at the time. The case sent me reeling. There wasn’t much I could do, as I wasn’t directly involved, yet it still tore at me. He had representation. Still, the case was very upsetting for me. There have been other cases, other people, who weren’t so fortunate. The idea that capital cases happened where lawyers slept through trial, and their clients ended up executed was incredibly disturbing. Every defendant should have competent defense, even if, no, especially if their crimes will put them on death row or they will face life imprisonment. I knew this when I was ten. Clarence Earl Gideon made that much of an impression on me. One of my favorite work-nerd things is the Amicus podcast from Slate/Panoply. 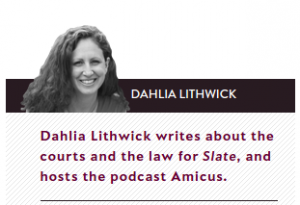 I’ve been a fan of Ms. Dhalia Lithwick (I well and truly squeeed when she was on TDS last month) for years, and to hear her as well as read her column is a lot of fun. Her end-of-term podcast is an interview with outgoing Solicitor General Don Verrili, and it’s a fascinating look into arguing before the present-day SCOTUS. This is a great listen. If you know a Government teacher, I highly recommend you pass Amicus on to them as a teaching tool.